Last time, we told you about Andrei. He sent us an article again to participate in the blog. Remember you can do the same by sending us a mail. Some might consider setting up a fuse box for a residential location a pretty simple task. 16 A circuit breaker and 2.5mm² conductor for wall sockets, 10 A circuit breaker and 1.5mm² conductor for lighting circuit, not very complicated. I should say the above values are for European 230V single phase circuits. But what if we had to distribute electricity to a workshop or a place that has different than usual loads like motors or power tools? Let’s have a look at how we can setup this circuit and the fuse box for it. Like with any other circuit we need to determine the total current required to power it. For our workshop example, most single phase power tools and equipment will be under 2000W and this is the safest maximum load to have on a 230V line running continuously. Above this power most likely the equipment will need 3 phase circuit. with U=230V and cosϕ depends on the load type. For resistive loads such as heaters, incandescent lamps, cosϕ=1, for fluorescent lamps with internal compensation cosϕ=0.8-0.95. You have to keep in mind that for fluorescent lamps Pi=Plamp + Pbalast. It is a good practice to keep loads under 2kW on each independently fused circuit but with motors and high current machinery we need to be careful what kind of circuit breaker we choose because many motors on start will draw a lot more current than the nominal value and this can cause the breaker to trip. There are 3 main types of circuit breakers or MCBs marked with the letters B,C and D. These differ in the instantaneous tripping current value with B having a value between 3 times and 5 times the nominal current, C between 5 times and 10 times the nominal current and D between 10 times and 20 times. Depending on motor you might need a C or D circuit breaker. According to IEC 60364-4-41 every wall socket circuit must be protected by RCD with a high sensitivity <=30mA. It is recommended not to have more than 8 sockets on the same circuit. For places like workshops, restaurant kitchens, laundry rooms I usually install a separate fuse box so that the circuit breakers are closer to the equipment. Once we have calculated the current necessary for all circuits at the location the sum of these current values will determine the wire section between the main fuse box and the remote one. 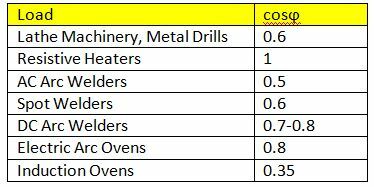 Please refer to the next table for additional estimation of cosϕ values for common electrical equipment. With all the loads distributed evenly on the new circuits and all the circuits protected accordingly with MCBs for lighting and RCBOs for wall sockets it is important to note that the MCBs role is to protect the circuit. The current rating should be the next step above the current drawn by load. So if load is 14A a MCB of 16A should be chosen along with the proper wire section for the circuit. The circuit breaker must protect this wire from overheating and potentially causing a fire or breaking the circuit. In low voltage residential installations distances are small enough to not pose problems with voltage drops along the lines but in my experience I have found many problems with earth connection when setting up a new fuse box. Another common problem was failure to distribute the load on all 3 phases at the general fuse box but this is a subject for another article. As we can see this subject is very vast and I will discuss more about it in future articles so be sure to check back in. or copy this trackback: http://engineering.electrical-equipment.org/panel-building/setting-up-a-fuse-box-and-calculating-loads.html/trackback from your own site. Thanks for this information . For air condition or split unit loads how can I convert from ( BTU ) to ( KW ) ?